Calling all lemon lovers! 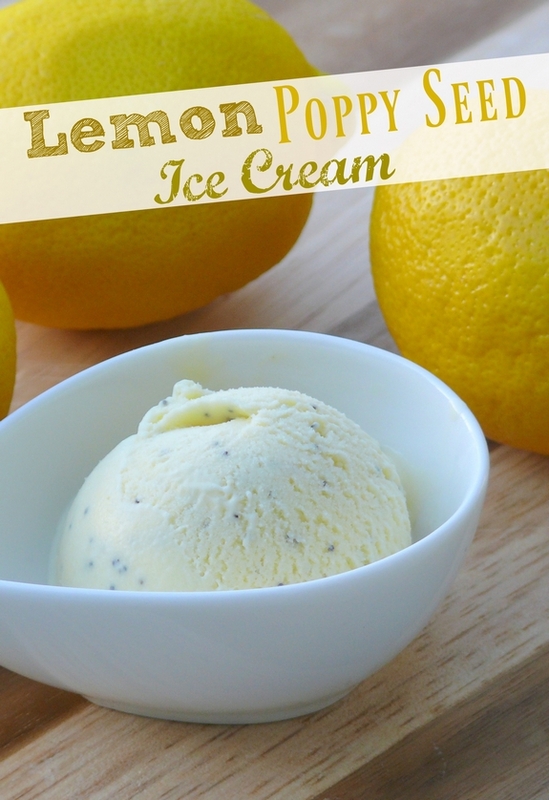 This luxurious Lemon Poppy Seed Ice Cream made with sweet lemon curd is all you need to satisfy your lemon-loving dessert cravings. This picture might be a little deceiving, I did not use fresh lemon juice in this ice cream. I just couldn’t help using fresh lemons in my photo. It’s funny, I looked at a lot of lemon ice cream recipes and all used fresh lemon juice and a milk-cream base. Doesn’t that make buttermilk ice cream? Why yes it does…so I don’t get it. That’s not lemon ice cream, it’s buttermilk ice cream. In fact, if you are looking for a buttermilk-lemon dessert, give my Buttermilk-Lemon Scented Cake Loaves a try. They are so good. Anyway, I decided to use lemon curd as my lemon flavoring and wow, what a great idea!! The ice cream turned out very lemony and sweet and just delicious. Lemon poppy seed cake is one of my favorites, so why not ice cream! You and your family are going to love this frozen treat. I am headed to the International Food Blogger’s Conference (IFBC) this weekend. It happens to be right in my backyard this year (Portland, Oregon). I have really been looking forward to all the activities planned around this event. First up, a magical pre-IFBC dinnner with specialty food company, Barhyte Foods. They are serving dinner and I will be pouring my wines for about 35 bloggers as well as friends of the Barhyte family. I have also been invited to a behind-the-scenes tour of Bob’s Red Mill given by Bob himself…can’t wait for that one! (it was awesome by the way). The weekend promises to be full of fun, food and friends. Stay tuned for updates, especially in the social media realm. I am so lucky to be surrounded by so many awesome people. Do you have an ice cream maker? This one is currently my favorite! I highly suggest adding it to your team of kitchen appliances. I use mine year round because Ice cream is not just a summertime treat. If you can’t get enough of all things ice cream, here are a handful of my favorite ice cream recipes. Rocky Road Ice Cream has always been one of my hand’s down favorites! This Hazelnut Chocolate Chip Ice Cream makes me happy every time I make it. This Two-Ingredient Banana-Peanut Butter Ice Cream is also one of my favorite recipes. And is there anyone who would turn down a bowl of this Cookie Butter Ice Cream? I sure wouldn’t. In a medium saucepan, combine milk, cream, buttermilk and sugar. Heat on low until sides of pan are slightly bubbly and warm, but not boiling. Add 1/4 cup of the milk mixture to the egg yolks and stir quickly, keep adding small amounts of liquid to the eggs until it it the same temperature as what is in the saucepan. Add egg yolk mixture to the saucepan and continue to heat until you can coat the back of a spoon. Do not boil!! Chill milk mixture and jarred lemon curd overnight. Add custard to the ice cream and begin churning. Add cold lemon curd. (This ice cream is more of a soft serve variety, it took about 40 minutes for mine to set up and then I froze for 4-6 hours.) Add poppy seed, a little at a time when ice cream is almost done churning. what a fabulous sounding ice cream! The ice cream looks and sounds so good! This sounds FABULOUS!!!! I am drooling over your icecream hahaha. This looks SO good! I love anything with lemon curd. Cathy, This sounds really yummy, but i have 2 lemon trees loaded with lemons right now. I’d like recipes to use them. Guess I can make my own lemon curd. My grandmother was British & I have her awesome recipe. Suggestion: I love poppy seeds & use them a lot, expecialy with lemon, however poppy seeds can give you a false positive blood test for opiates. My brother works for the FAA & is randomly tested, so I never add poppy seeds to anything I make when he will be coming to dinner. Recently, thanks to Dr. Oz, I have discovered Chia seeds. They look like poppy seeds & are rich in soluble fiber & Omega 3 fatty acids. I am going to try baking with them instead of poppy seeds & see how it works. They are also much cheaper than poppy seeds & you can get them at the grocery store. No need to head to the health food store. Cathy, your recipes always sound so good! Very dreamy pictures, too. Thanks for sending me home with a bottle of wine last week at the Saucy-Mama party! It was great wine (yes, gone) and even better to meet you in person. You’re lovely! Ohhh yes…genius on using the lemon curd!!!!!! that looks so fresh ice cream, very interesting ! I just snapped a picture of this on my iphone and sent it to my boyfriend who responded “I’ll do anything if that’s for dessert this weekend.” This is a major win! Can’t wait to try it!!! I just wanted to tell you that lemon reacts differently with heavy cream because of the fats. I have a wonderful ice cream recipe that you first cook the cream and milk with the zest, then at the end you stir in the lemon juice to the custard base. It is absolutely the best!